Join the #ManoPoInay Guessing Game Contest and Win Special Prizes! Since November is Filipino Values Month, we seek to promote greater consciousness of the values that are uniquely and positively Filipino. 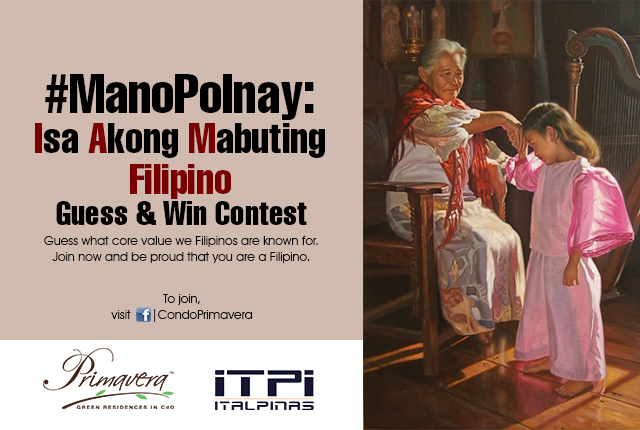 Values are the roots of traditions that Filipinos find important in their day-to-day events. They are instilled early in life, are deeply rooted, and are resistant to change. They are developed from people’s direct experiences with others who are important to them, such as parents, teachers, friends, and classmates. As Primavera Residences celebrates the month of Filipino values, we want to engage to the public how well you know the core values that we, as Filipinos, are proud of. Starting this Tuesday, November 18, we will be posting a photo that indicates one unique Filipino value. On the following dates: November 18 and 25 (Tuesday) and November 20 and 27 (Thursday) at 10AM of this month, a photo will be posted on our Facebook page, Primavera Residences. The photo will depict a known Filipino value. To join the contest, all you need to do is post your answers in the comment box. Every Wednesday and Friday at 5PM, we will close the contest for the week. *The photo will be hidden from the page timeline. Winners will be drawn every Friday among contestants who gave the correct answers. For each photo, 3 winners will be announced on Saturday November 22 and 29 . Prizes will be announced soon. Join now and be proud that you are a Filipino.